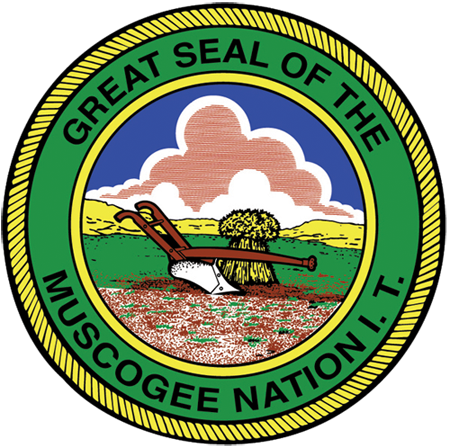 The Muscogee (Creek) Nation is one of the largest federally recognized tribes in the United States, with a population of 71,651 enrolled citizens as of October 2011. The tribal government’s Communications Department publishes the semimonthly Muscogee Nation News, which is mailed to about 8,500 households. In May 2009, I began contributing a regular column on environmental issues affecting tribal members in eastern Oklahoma and elsewhere. Each installment of Mvskoke Country offers a topical perspective on enduring themes in human ecology; I try to connect local concerns with global realities and to reconnect Mvskoke cultural traditions with the natural world. Many columns incorporate insights gained from a close study of the Mvskoke language, which bears evidence of ecological decline in the historical period. These monthly pieces are archived here, and they’re part of a larger project on the role of climatic changes in tribal environmental history. This website is also a portal featuring links to current news articles about the Creek Nation and to other Mvskoke resources. In February 2010, I presented this work at the Food Sovereignty Symposium organized by the Mvskoke Food Sovereignty Initiative. In July 2010, “West Texas or Worse” (November 2009) was awarded second place in the Best Column Monthly/Bi-Monthly category at the annual Media Awards of the Native American Journalists Association. Mvskoke Country columns have been republished in print by Cultural Survival Quarterly, New World Outlook, This Week from Indian Country Today, Native Sun News, American Indian Horizons, Mvskoke Food Sovereignty Initiative Newsletter, Cokv Tvlvme (Seminole Nation of Oklahoma), and Poarch Creek News; and online by Associated Content, United Nations Environment Programme E-News Service, Forum on Religion and Ecology at Yale, Indianz.com, and Native American Times. In January 2011, I added a web-only feature: field notes, a weekly feed of vital insights from the archive on Mvskoke ecological knowledge. New posts appear on Wednesdays, Ennvrkvpv—literally, “the middle of (the week)”—because that’s where we humans stand with respect to the natural environment: in the middle of things, and with no clear way out of the ecological crises we’ve created. You can receive the full text of each week’s post, and of each monthly column when it’s archived, in your email inbox; just enter your address in the “Email Subscription” box on the right sidebar and click the “Subscribe” button, then check your email account and confirm this subscription by following the link provided. This is an automated service and your address will not be used for any other purpose. If you like what you read, tell a friend. I am descended from the Evans and Escoe families, whose allotments were in the Oktaha area, south of Muskogee. I was born in Anadarko, in the western part of the state, and grew up in off-reservation communities in northeast Kansas and western South Dakota. After graduate study in Berkeley, I held faculty appointments at UC Santa Cruz, the University of New Mexico, and OU in Norman before moving to the University of Illinois in 2005. I teach courses on indigenous religious and ecological traditions and on the role of nature in contemporary criticism. My research and writing focus on American Indian environmental issues, especially in the context of global climate change. More information about my work is available at http://jamestreat.wordpress.com.